We play and run roleplaying games. It’s as simple as that. If you have never heard of a table-top roleplaying game (RPG), you may have heard of roleplaying video games. In these games you play a character and make decisions in their name to fulfill a quest. That’s the essence of RPGs: you play (act) as a role (character, that you typically design yourself, that you’re interested in). This doesn’t mean you need to dress up in your robe and wizard hat – we don’t mind if you do, but still. Rather, roleplaying is essentially interactive storytelling, with the main aim of making you immersed in your character. It’s also fun! In table-top RPGs though, you do not play alone. You and your fellow players each have characters. All the characters played by the players are called PCs (Player Character). You may also encounter characters throughout the game played by no one, and narrated by the GM (Game Master) /DM(Dungeon Master); these, are called NPCs (Non Player Characters). A GM is the person that runs the game. Their roles are those of an arbitrator, narrator, voice actor and writer all rolled (pun intended) into one – the job of a GM is both complex and rewarding – and this combination results in them being the judge of how the story both acts and reacts. How does the evil sorcerer sound when he monologues? That’s the GM’s role to decide. Should the characters fight the evil sorcerer, or try to convert him to the cause of good/law/money? That’s the PC’s role. How does the evil sorcerer react to attempts to bribe him with money and virgins? That’s the GM’s job to decide and describe (in a dastardly fashion, usually). 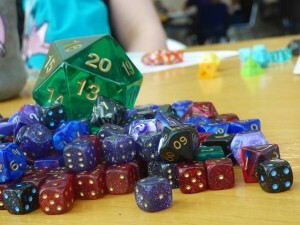 If you have seen people playing a table top RPG, you’ll have noticed it often involves dice (but not always). This is because your decisions and the abilities of your characters are aided and adjudicated by a standard set of rules. For example, in a turn, in a given game, I’ll be able to attack once with [name] heavy weapon which does 1d10 damage. In most games you’ll have to roll dice to know if you hit and if you do, typically roll damage. 1d10 means “roll one 10 sided die”; it is standard notation and thus somewhat universal. Worry not, though – you, as a player, don’t need to know all the rules of any given game you’ll be playing (although it helps, much like being mad), that is what the GMs (Game Masters usually need to know most of the rules to fulfil their typical role of arbitrator), and rulebooks are for. RPGs can be played as one-shots or campaigns. One-shot sessions are stories that start and end in one session (a session generally lasts between 3 and 5 hours). There are usually more one-shots being run at the Sunday session rather than the Wednesday session, but neither campaigns or one-shots are exclusive to either session. One-shots allow the GM and the player to try out new things, practice running or playing a certain system, or simply just have fun and/or be silly without long-term consequences. Campaigns, on the other hand, can last for a whole year, with each session continuing on from the last. Campaigns are the primary way to play RPGs, allowing your characters to develop, level up, and giving the players and the GM a chance to play/run more complicated and longer stories and quests. 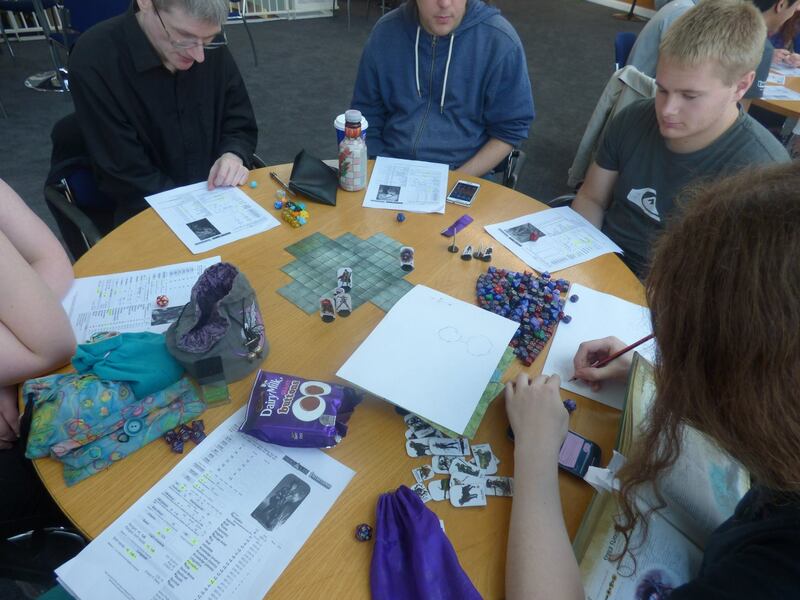 We generally play the campaigns on Wednesdays, but some Game Masters run campaigns on Sundays as well. If you want to have a look at what we do, or start playing, come along to one of our sessions, on either Wednesday or Sunday. 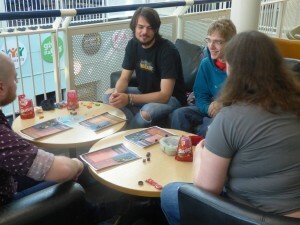 We meet in the Gallery (in the Sheffield University Student’s Union). 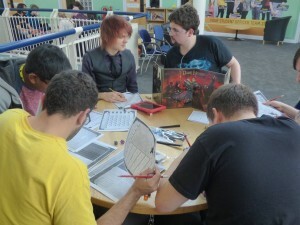 Many players and GMs arrive early and play board games and card games beforehand, so feel free to wander up to people playing such games on these evenings – chances are they’re from NoDDSoc. We’ll be do our best to find a game for any new members, even during the course of the year (visit the What’s On page or the Facebook group to find out what games are being run this semester and which want more players). 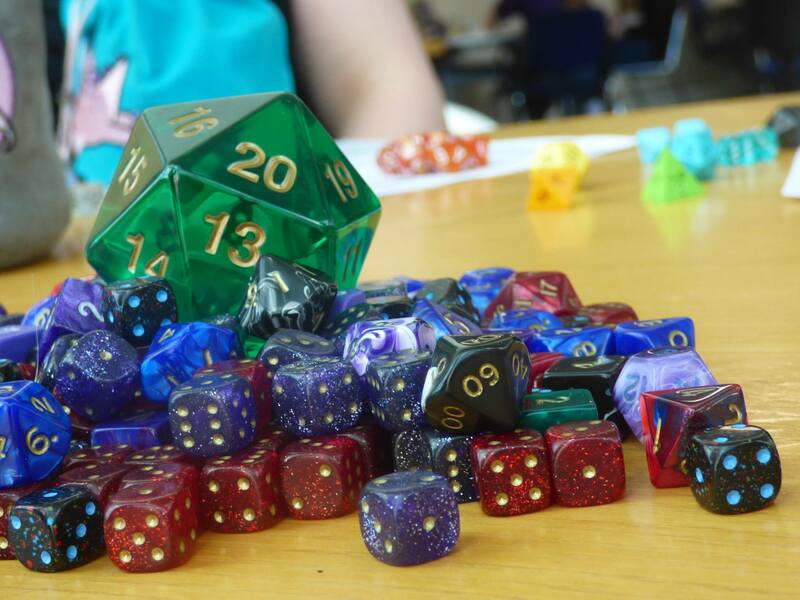 Don’t worry about dice or rulebooks – if you don’t have any, we’re happy to lend you some, either from the society library or other players – we’re a friendly bunch!